Fleur Cowles. Image from the Sydney Morning Herald. Mention Fleur Cowles to those who claim to have a pulse on style and the term 'icon' will inevitably pop up. Until I was flipping through a photo gallery at flickr and came across a shot of Flair magazine, I confess I'd never heard of her. Intrigued by the simple red cover, with it's white lettering and strange graphic that I couldn't quite make out, I launched into some research. I discovered Cowles was born in New Jersey in 1908 and was an editor, writer, artist and style guru of some note. After a stint as a columnist and a couple of marriages, in 1937 she became executive vice president of an advertising agency, which she co-founded with her second husband Atherton Pentigall Jr. 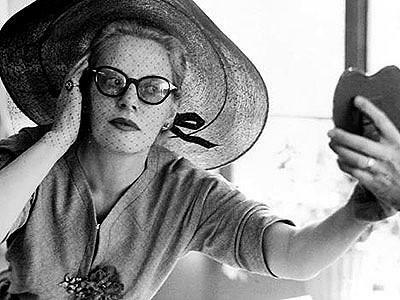 In '46 she left the agency and Pentigall behind and married Gardner Cowles Jr - heir to a Media Company which counted Look magazine among its publications. Cowles began working as associate editor at Look, which she successfully peppered up with fashion and food additions and later worked in the same postiion at Quick magazine. 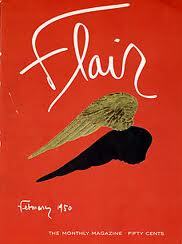 The short-lived Flair magazine was launched by Fleur Cowles in 1950 but was evidently too lavishly produced to be sustainable as a commercial venture and thus folded a year later. The magazine cost $1.60 to produce and sold for 50 cents - one of many costs that couldn't be recouped by its corporate advertising, yet it was Fleur's baby - her vision for a magazine that, according to journalist Veronica Howell, drew from the artistic ambitions of Manhattan's best magazine talent and combined "surrealist collages (Dali was a contributor), Japanese ephemera, memories of 1920s stencilled fashion plates, and the pop-up and pull-out books of their childhoods". "Flair was a short-lived, loss-making, vanity project, meant to showcase the persona Fleur had invented for herself. Media professionals and students have admired it ever since its 12th and last issue appeared on US newsstands in January 1951." "I have an idea a minute..."
Cowles, who died in 2009 at the impressive age of 101 was, as she said of herself, "an ideas person" with many skills...in addition to her editorial skills she served on various governmental committees, wrote sixteen books, was a painter and illustrator, designed tapestries, accessories and china. She was also tough and ambitious, at a time when such traits weren't considered becoming in a woman. As a result of hard work, ego, talent, an eye for art and design and a couple of fortuitous marriages, she amassed a personal fortune and in Flair, left a lasting legacy of style for students of design to admire and covet. Oh..and I just don't know how I missed it before but I can see so easily now that that illustration on the cover is...a wing...a fitting symbol for a woman who so clearly wanted to fly.